PLEASE NOTE : The Salve Regina will be sung after the 7:00 am Mass. 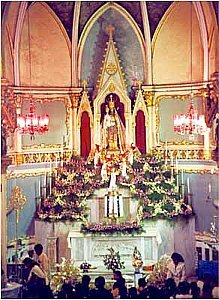 A majestic quasi-Gothic edifice, the Basilica of Our Lady of the Mount, Bandra, has crowned Bandra hill for the last one hundred years. It was in 1904 that this elegant Shrine was blessed and opened for public worship. The Basilica of Our Lady of the Mount, more commonly known as Mount Mary, is a Roman Catholic church in the city of Mumbai, India. 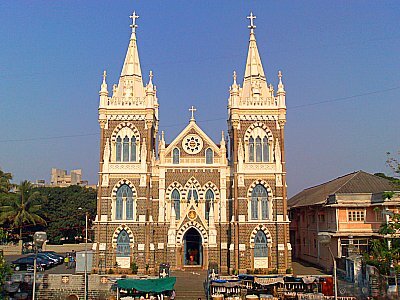 The church is one of the most visited churches in the city located in the suburb of Bandra. Every September, the feast of Mount Mary is celebrated on the Sunday following 8 September, the birthday of the Virgin Mary. This is a week long celebration known as the Bandra Fair and is visited by thousands of people. 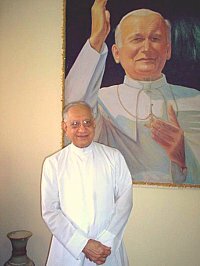 The present Rector is Msgr. Nereus Rodrigues. (pic below) The church stands on a hillock about 80 metres above sea level overlooking the Arabian Sea. It draws lakhs of devotees and pilgrims annually. Many faithful attest to the miraculous powers of the Mount. During the Bandra Fair, tens of thousands visit the shrine. The shrine attracts people from all faiths who pray to the statue for thanksgiving or requesting of favours. During the Bandra Fair, the entire area is decorated with festoons and buntings. Many pitch up stalls selling religious objects, roasted grams and sweet items. Stalls sell sticky Goan sweets and wax idols of the Virgin along with an assortment of candles shaped like hands, feet and various other parts of the body. The sick and suffering choose one that corresponds to their ailment and light it in Church, with the pious hope that Mother Mary will consider their appeals for help. Although the current church edifice is just 100 years old, the history behind the current statue of Our Lady goes back to the 16th century when Jesuit priests from Portugal brought the statue to the current location and constructed a chapel. In 1700 Arab pirates interested in the gilt-lined object held in the hand disfigured the statue by cutting off the right hand. In 1760, the church was rebuilt and the statue was substituted with a statue of Our Lady of Navigators in St. Andrew's church nearby. This statue has an interesting legend. It goes that a Koli fisherman dreamt that he would find a statue in the sea. The statue was found floating in the sea between 1700 and 1760. A Jesuit Annual Letter dated to 1669 and published in the book St. Andrew's Church, Bandra (1616–1966) supports this claim.